Considering orthodontic treatment to create the beautiful smile you always dreamed of? It is a big decision and one that requires research if you are considering Invisalign as an alternative to traditional braces. Both will lead to your new smile, but the roads traveled are quite different. Orthodontics & Dentofacial Orthopedics showed that having “ugly” teeth plays a huge part in childhood bullying. According to the study, teeth were the number 1 targeted physical feature of bullies, followed by strength and weight. The correlation between self-esteem and a person’s smile is commonly known among orthodontists, and isn’t just true for children, but can affect people of all ages and status. 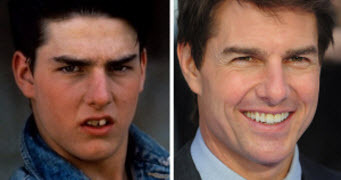 Did you know Tom Cruise was a victim of smile bullying? He has had orthodontic treatment twice to fix his teeth. The first time was as a child to straighten his teeth and broaden his smile, and once again as an adult to correct a midline discrepancy.